For reasons now lost to history the United States Mint did not coin dimes for circulation until 1796. In a decimal currency this denomination should have been among the first produced. Perhaps the abundance in this country of Spanish one-real pieces (valued at 12-1/2 cents) reduced the need for dimes. In any case it was not until 1796, when Mint Director Elias Boudinot made a determined effort to have all denominations coined, that the first dimes were issued. The Flowing Hair design had already been retired by this time, so the dime bore Gilbert Stuart's portrait of Liberty, as engraved by Robert Scot. A small eagle set within clouds and a wreath appeared on the reverse, statutory inscriptions making up the balance of the coin's design. 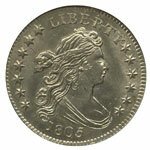 With its edge too thin to support lettering, no statement of value was to be found on the dime. Examples were coined bearing every date from 1796 through 1807, with the exceptions of 1799 and 1806. Coins of this era were not always struck in the year indicated, a common practice through the mid-1830s, as the thrifty U. S. Mint opted to use dies as long as they remained serviceable. 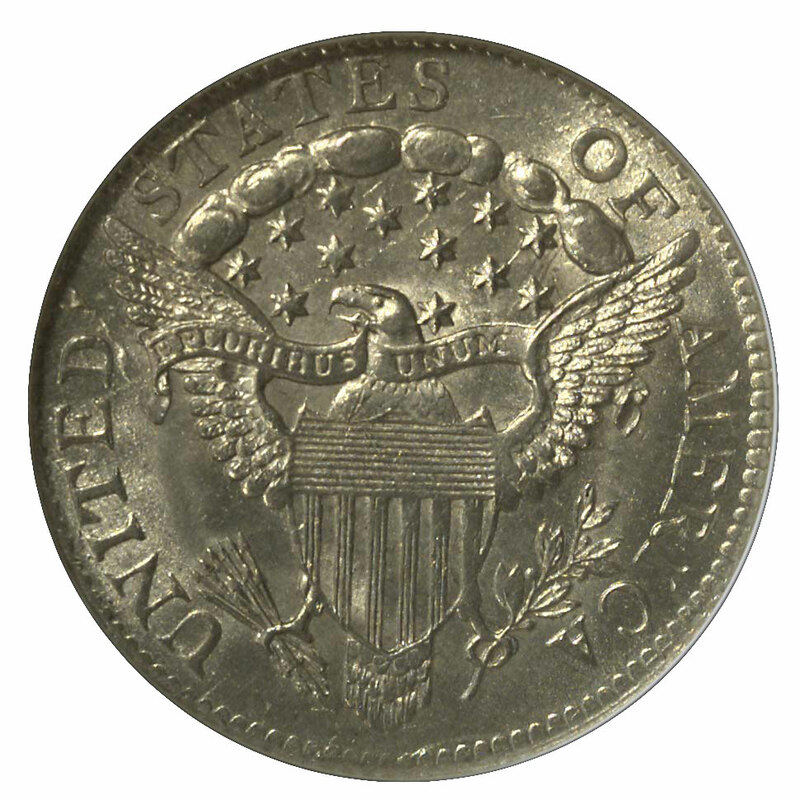 The Small Eagle reverse of 1796-97 was replaced in 1798 with a Heraldic Eagle design based on the Great Seal of the United States of America. In this form the dime was coined through 1807, a suspension in coinage during 1808 being followed by a complete design change in 1809. All dimes bearing the Small Eagle reverse are scarce, irrespective of grade, though the 1796 emission is certainly more available than pieces dated 1797. This is especially true of uncirculated dimes, the 1797 coins being nearly unknown in such condition. Unlike the half dimes of this type, the dimes are likely to be found well struck and evenly worn. Their larger size seems to have spared them from the bent and irregular planchets so often seen for half dimes. 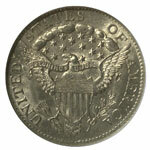 Other forms of damage, however, are not unusual for Draped Bust/Small Eagle dimes. These include scratches, scrapes and harsh cleaning, all of which will disqualify such coins for certification by the major grading services. These same problems are often seen with the Draped Bust/Heraldic Eagle dimes of 1798-1807, and they are further aggravated by poor strikes and flawed planchets. 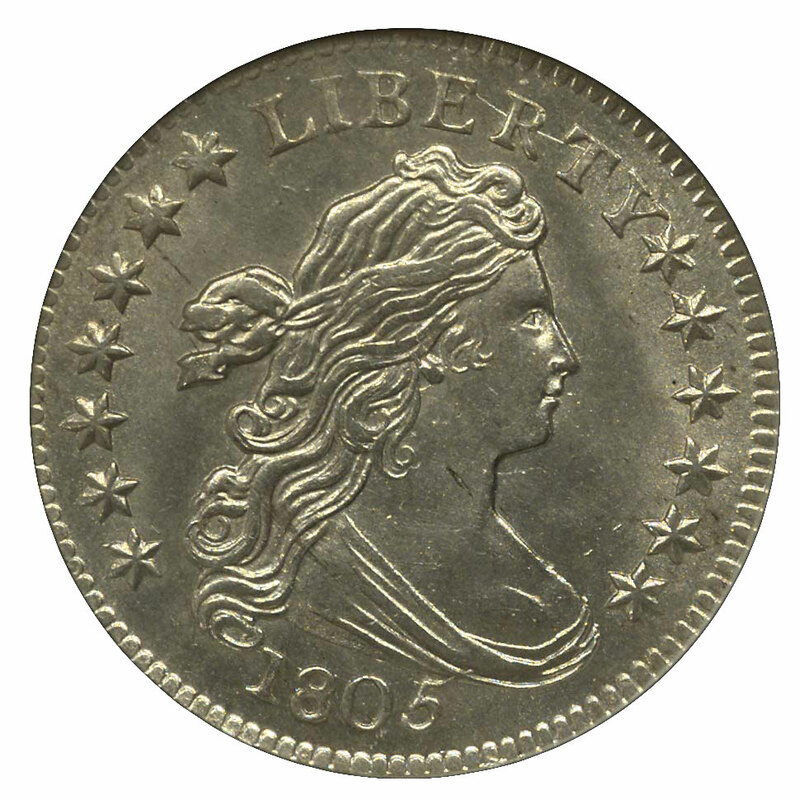 The quality of U. S. coins in general declined during the first few years of the 19th Century, and the most commonly seen dates of 1805 and 1807 are also among the poorest made of Draped Bust dimes. These are the only dates that are readily collectable in uncirculated condition, yet buyers should avoid the temptation to settle for flashy, lustrous coins that are largely lacking in detail. Weak centers and borders are common for these dates, especially 1807. Patience will be rewarded with the rare, sharply struck example. Since grading services don't place great emphasis on striking quality, some of the most desirable type coins do not necessarily carry high grades. Another problem common to dimes dated 1796-1807 is the presence of adjustment marks. Overweight planchets were filed across their faces prior to striking to bring them into conformance with the legal standard. These filing lines may remain visible after striking, especially on the relief elements such as the bust of Liberty and the eagle. Subtle adjustment marks will not affect a coin's grade, but very obvious or deep ones are likely to impair both its grade and aesthetic value. Most United States coins of this vintage have been cleaned at one time or another, usually generations ago. While some have been just lightly cleaned and remain certifiable, others have had their natural appearance so altered as to render them unacceptable to the major grading services and to the more discriminating collector. Unless one is determined to own each date and variety for this series, there should be enough Draped Bust dimes in the marketplace that a suitable type coin will be found with patience.